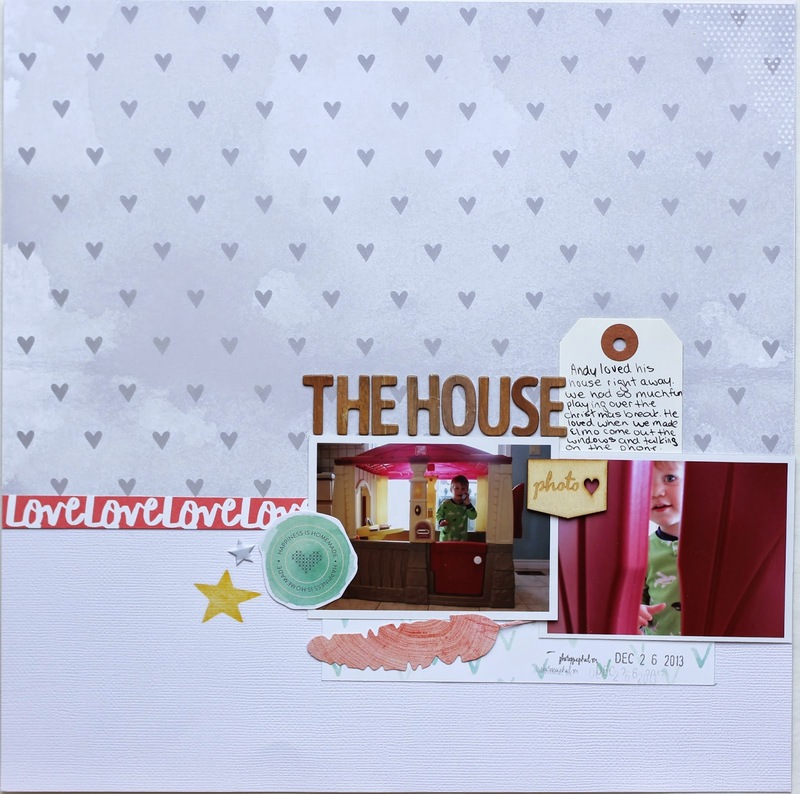 That would be 12 layouts and 3 6x8 Project Life spreads made with the December Hip Kit Club kit. I don't think I could have loved this kit any more. The papers were just beautiful and it had the perfect amount of embellishments and alphas. 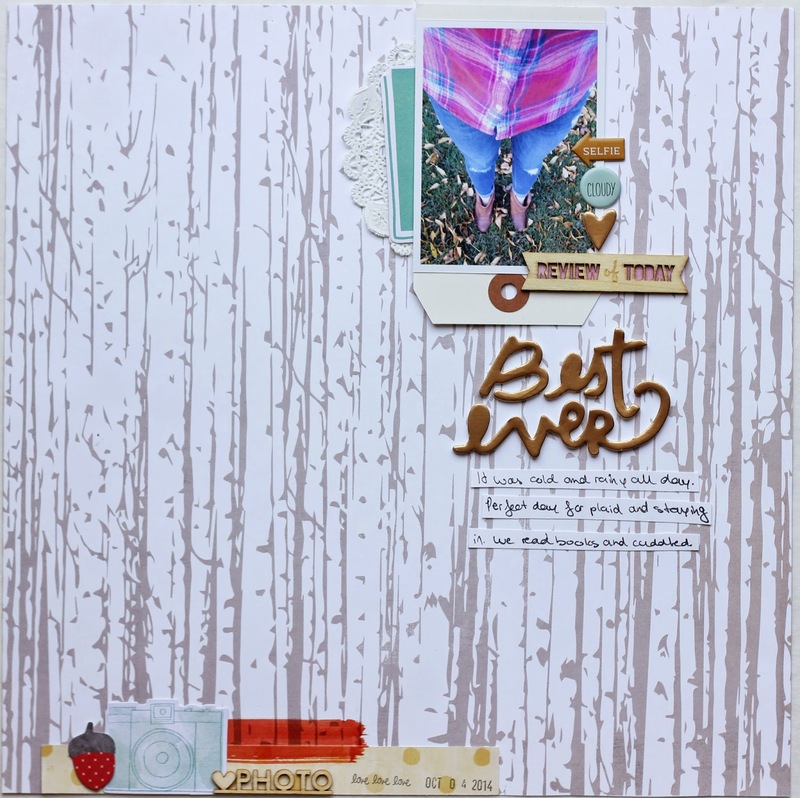 The kit featured the new lines from Amy Tangerine, Pebbles, and Heidi Swapp, as well as embellishments from Evalicious. I only got the main kit and I just can't believe how many layouts I was able to complete. I actually have lots of the gold word thickers, wood grain thickers and Amy Tangerine die cuts left. This kit was just so full of amazing items. I don't have much patterned paper left though, so I consider this kit killed and will move the remaining embellishments into my stash. I think this might be my favourite layout I made with the kit. The colours go perfectly with my photo and I loved that the wood veneer camera said "adventurer" on it. Perfect for a photo of my curious boy out for a walk. That wood grain paper is just perfection. I immediately thought of this selfie I took on a rainy fall day and knew they would go together. 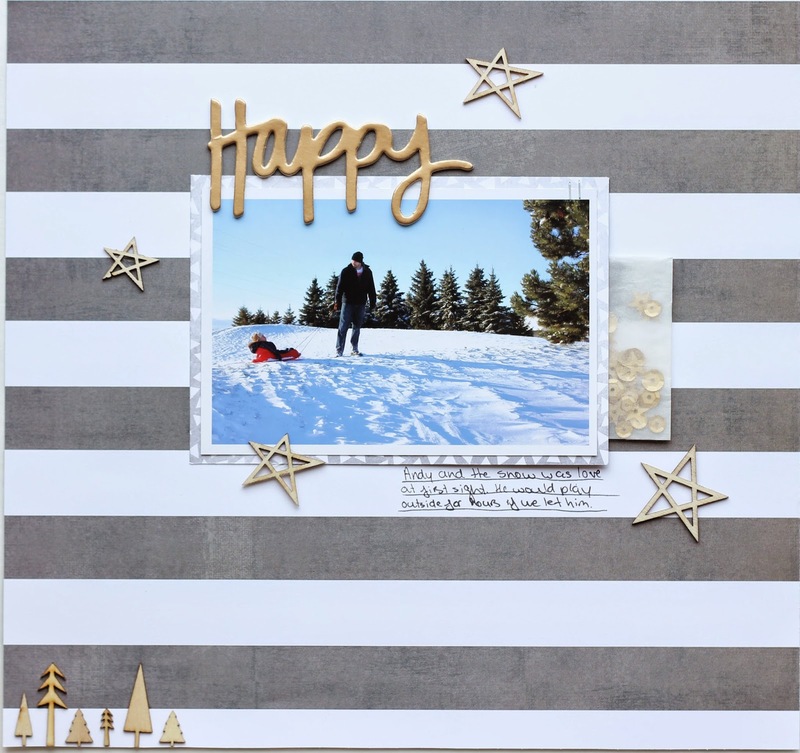 I added in some wood veneer stars and trees, as well as some gold sequins from my stash for this layout. It's pretty rare for me to use anything other than white cardstock as a background, but I really love the way this black and white striped paper goes with my photo. I am just crazy about those Dear Lizzy gold word thickers. Wood grain thickers are actually a serious weakness of mine and I really loved the ones that came in this kit. I just couldn't stop using the gold thickers though and they ended up on most of my pages. 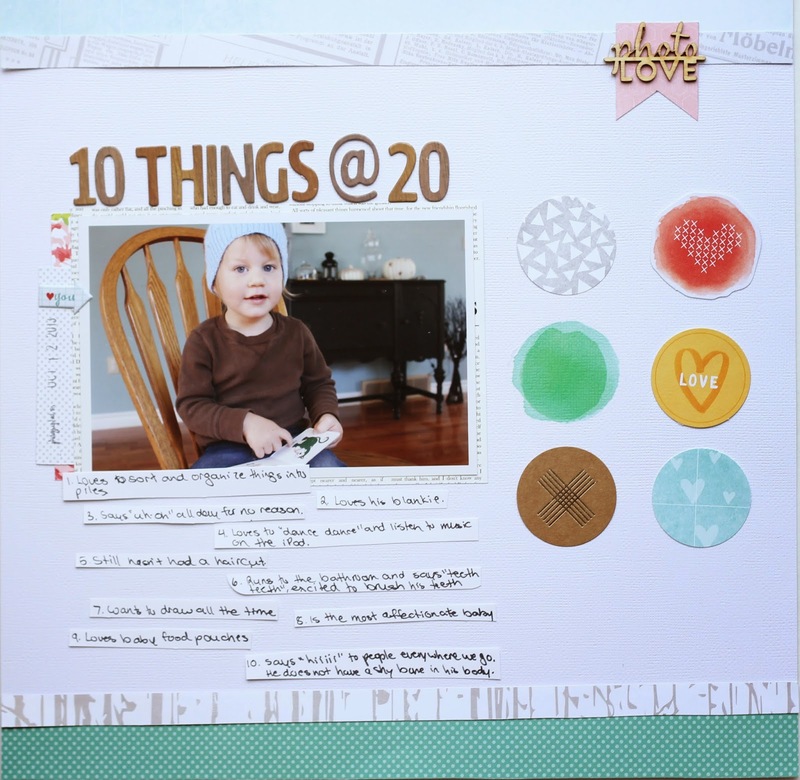 I used a grid pattern for this layout to get as many embellishments as I could on the page. To keep it from being too busy, I tried sticking to blue, grey and gold colours. I made this layout based on a sketch from Paper Issues. 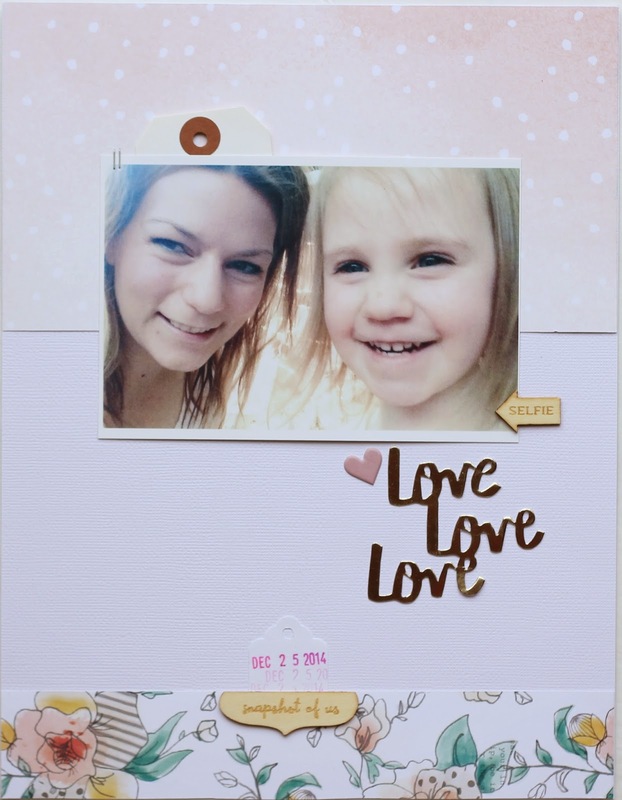 Those floral die cuts with a bit of gold were my favourite in the pack and they went perfectly with the soft pink paper with white polka dots. That floral paper was definitely my favourite in the entire kit. I really wanted to use the entire sheet as a background, but I just couldn't make it work. I really love it here grounding a layout of a selfie my niece, Ruby Sky, and I took on Christmas day. She really loves to selfie! I based this entire layout around that section of paper that says "cozy up to a good book". I actually really struggled with this one and pushed paper for way too long, before just deciding to glue stuff down. I'm not entirely happy with it though and feel like it's missing something. I may add to it later. 'Shine' is the perfect way to describe my youngest niece. She is just the happiest baby. I really like that blue "v" paper by Amy Tangerine and think it would make a really nice background paper as the pattern is subtle. I just love how this one turned out. I know I basically just cut the piece of patterned paper apart and glued it to white cardstock,but it adds a little more dimension than just using the paper as is. If my sewing machine was working, I would definitely have sewn lines through each strip of paper. I added the gold star rub ons to my photo and my title in between a strip of paper. Super simple, but I'm really happy with it. That photo of my son also makes my heart melt. It's just so him. 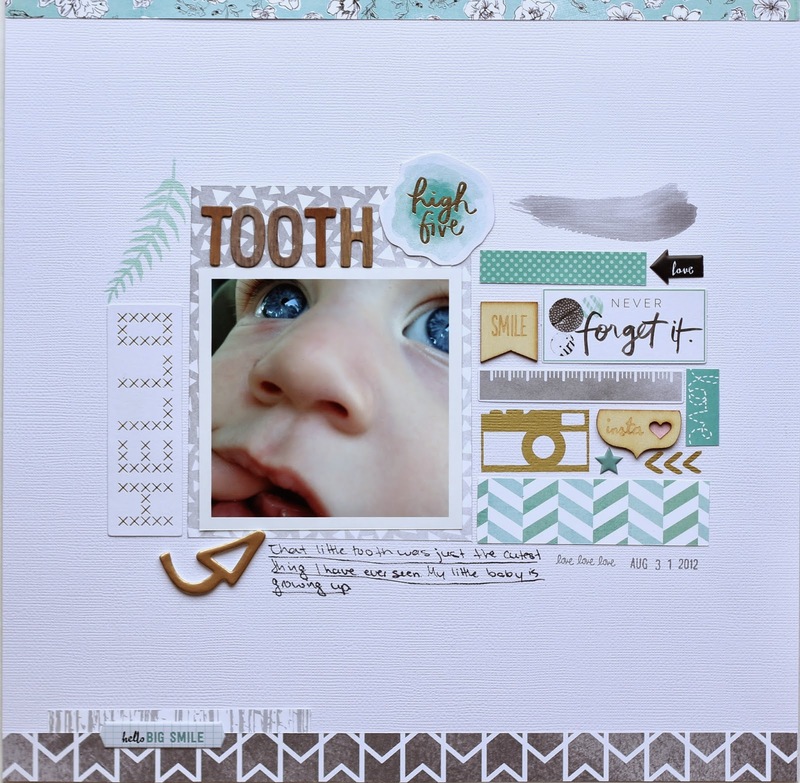 This layout is based on a sketch and love how much of the grey heart paper I got to use here. Amy Tangerine makes such amazing patterned papers. They often have really subtle patterns that work so well for backgrounds. This one is also based on a sketch. The circles are die cuts from the Amy Tangerine pack that came with the kit, one circle rub on and a few are just circles I punched from papers that came with the kit. 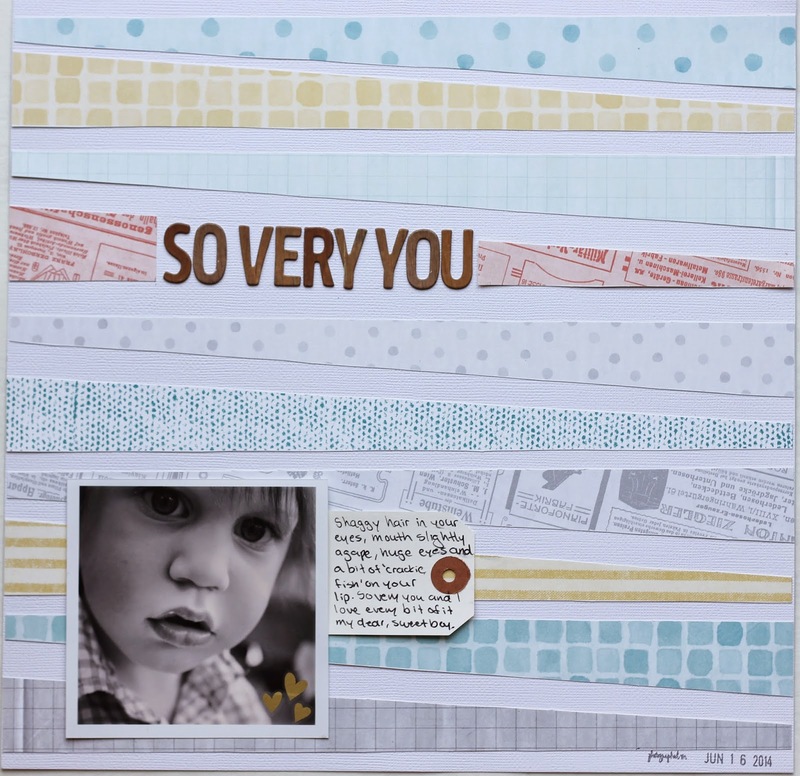 I also made 3 6x8 Project Life spreads, however it turns out the photos I took are all blurry, so I'll have to re-take them later. My January Hip Kit Club kit should be arriving in about two weeks and I'm just so excited. I also got the embellishment add-on this month and can only imagine how many layouts I'm going to be able to make with this one. I'm really happy with my decision to subscribe to the Hip kits after only two months. 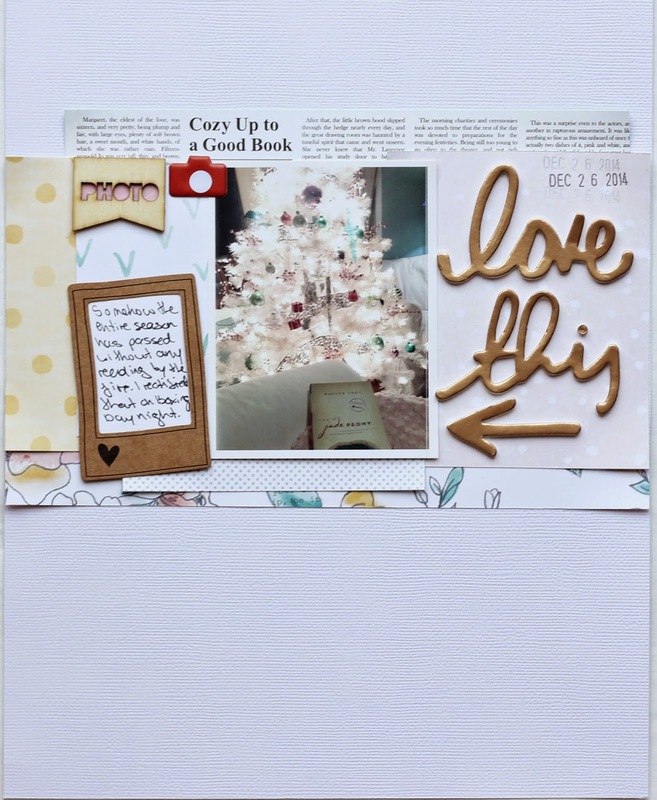 They are filled with the latest and greatest in the scrapbooking industry, Kim, the owner, is incredibly nice, the design team is crazy talented, and there is a wonderfully friendly Facebook group filled with amazing inspiration. I strongly urge you to check out Hip Kit Club if you haven't already. I promise you will love the kits! Thank you so much Marinette! All the layouts are great, I really like your restrained use of patterned papers (as you probably know, I pile it on...) and all the white cardstock. Really makes them look classic, and also when you do use something bold as background like the striped paper, it's quite a statement. Thanks for sharing! Thank you very much Tanina! That is very sweet to say. Thank you so much Kimberly! I really appreciate your sweet comment!